MANILA, Philippines - The November 2017 Agriculturist board exam results which include the complete list of passers, top 10 (topnotchers), top performing schools and performance of schools are officially released today, December 7, or in five (5) working days after the exam. 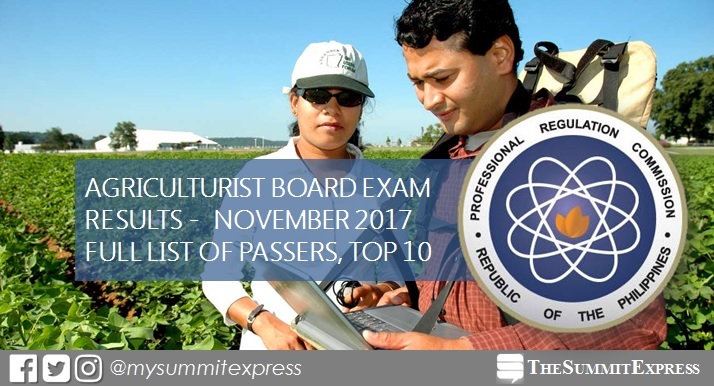 Agriculturist board exam was administered on Tuesday to Thursday, November 28, 29 and 30, in the cities of Manila, All Regional Offices and Zamboanga. From December 27 to 28, registration for the issuance of Professional Identification Card (ID) and Certificate of Registration will be done on-line. Please go to www.prc.gov.ph and follow instructions for initial registration. In accordance with PRC Resolution No. 2016-1019, the target release of November 2017 Agriculturist board exam results is on Thursday, November 7 or in five (5) working days after the exam. In the April 2017 Agriculturist board exam, results were released in four (4) working days after the last day of tests. 927 out of 2,938 passed the series of exams. None of the schools qualified for the top performing list by PRC. In October 2016 exam, results were released online in five (5) working days. A total of 1,790 out of 5,795 passed the examination. University of the Philippines (UP) - Los Baños was the only top performing school with 96.83% or 122 out of 126 passed the exams.